It wasn't until I came across two different models on two different sites that this thought came to me. How many of us take the time to tie our models into the environment we've so carefully crafted and placed them on? Sure, we go to all ends to create a cool looking base, but then most of the time, we just plop our model down on top and call it a day. Both examples above go that extra step and tie the model to the environment they're in. 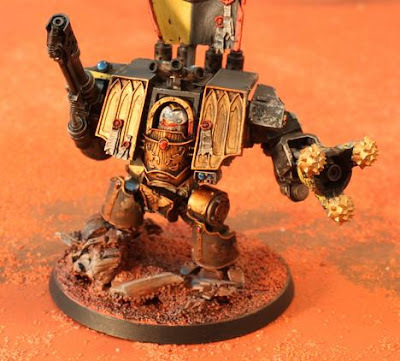 In the case of the Red Scorpion Venerable Dreadnought by Red's Corps, his whole lower portion is covered in that fine red dust you'd expect to see covering everything operating on the planet. The Lucas the Trickster model is the same thing in a slightly different way. Most of the time when you see snow... it's under the model's feet. 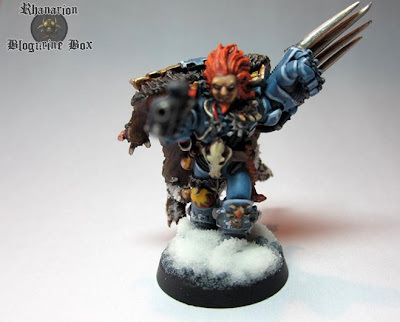 I absolutely love that Blogurine Box added the snow on top of his feet and even on the bottom edges of his cape. It gives the snow some real depth and makes it look like this guy is bounding through the deep stuff. The model and the base together create the illusion. Both compliment each other. The model lends credibility to the environment and the environment makes the model real. Next time you go to base a model, it might be worth seeing how you can bring both halves together for a more complete look. I've been giving this some thought too. Here are the links that set me off. Another interesting thought is that rather than the base being an extension of the miniature and a link with the tabletop, the miniature is actually an extension of the base, and the base is a part of the game world. Thanks Ron, I really appreciate it. I've been hanging to do this since painting up my desert board and now I can't stop weathering them all to suit the dusty environment. I actually can't see another way to do it. To me, the model must fit with its environment to look completed. Anything less to me looks half finished. I guess it comes from years of working in the Red deserts of Australia with heavy machinery, everything ends up covered in bulldust, no matter how much your little robo-gibbles wash things. Love what you said here Porky, perfect..
Not doing this is just pure laziness. Porky: Thanks for sharing the links. Red: You did a great job weathering your dreadnought, be proud of it. It made a great example here and it's my pleasure to share it. Mr Esty: I love your comments. You are that one "voice" each blog has. I'm glad I have you here to keep things in perspective. As far as being lazy... maybe in some case. Other times, it may be a matter of not knowing how to do it well enough (weathering) or maybe the person is afraid they'll ruin all the work they have in their mode so far. Aw Ron, I'm sorry if I come off sounding like a jerk; I don't mean to be negative. This is a great post and it does highlight an area I wish people would spend more time on. I just think that if you bother to paint your mini, and to base it... then you have all the materials you need to tie the two together and finish the job/ complete the illusion. Mr. Esty: You do have a valid point there. You should have all the materials on hand if you've gotten to this point. Maybe it's a confidence thing. I know I am hesitant sometime when I try out new things and usually do a couple test models before giving it a go on the real thing. I've been expanding on my making my models one with their environment and am very happy with the weathering results. I think they fit quite well.